Private and public tennis court construction and installation for outdoor and indoor tennis courts with regulation court dimensions is now available at Southwest Greens. Build a court featuring court lighting for night play and an interlocking modular surface requiring no repairs or resurfacing and built to reduce stress on the joints. Our sport athletic courts are found in private residences, apartments and condos, schools and universities, clubs, parks, and more. Enjoy the game you love on a court built for optimum performance. Build a regulation court that brings the game of tennis home with you courtesy of Southwest Greens. Building a court is a great way to take your tennis game to an entirely new level while assuring hours of fun with friends and family. Private or public tennis court construction is done in a timely fashion by the professionals at Southwest Greens. Our outdoor and indoor tennis courts feature regulation court dimensions and a surface built to last with no repair or resurfacing required. Build a testament to the game you love and experience it in the comfort of your own backyard! 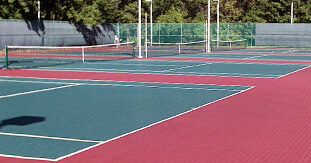 Our outdoor and indoor tennis courts feature regulation court dimensions and a unique modular surface for maximum performance and durability. Let Southwest Greens begin your tennis court construction today.